The feisty, fun to drive, well-handling 2018 Lexus IS 300 adds five more horses to its V6 engine this year, a choice between all-wheel or rear wheel drive, and some former options have become standard. Once costing a couple hundred dollars or so a year depending upon services chosen, Lexus Enform Safety and Service are now free for 10 years. That means the automaker’s 24-hour call center can locate your vehicle when it is stolen, send help if you need emergency assistance or tell you where you are parked. The center is also notified automatically if you are in an accident and can dispatch help if you cannot respond or request it. You also can get vehicle health information, plus email and other features. The backup camera is now standard on the compact luxury sedan and an articulated front light system is now available as an option. We test-drove the all-wheel drive with five options totaling $4,970. They included include navigation, rear window shade, heated/cooled front seats, 18-inch alloy wheels with all season tires and a comfort package with several safety features. The rear-wheel drive IS 300 uses a smaller four-cylinder engine and replaces the IS 200t. With subtle, sculptured good looks, our IS 300 provided decent punch from a start with the 3.5-liter V-6 engine, using steering wheel mounted manual paddles in Sport drive mode. Other drive modes are normal, ECO or snow. Sport will thrill drivers able to hop onto a racetrack. Driver confidence is boosted with sharp braking power. 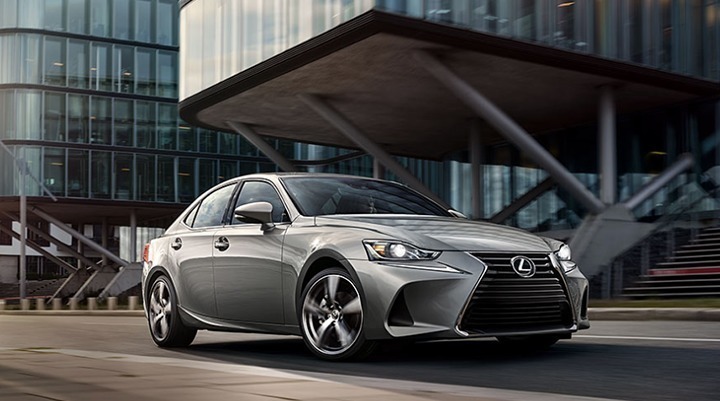 The Lexus IS 300’s luxury, performance, and cabin comfort holds its own with other premium sport compact sedans such as BMW’s 325i, Audi A4, Cadillac ATS and Mercedes-Benz C240. The Lexus Safety System+ became standard last year and includes dynamic cruise control, lane warning/keeping assist, automatic high beam diffuser and pedestrian detection. (The 2017 Lexus LS 300 received top crash safety ratings). In the cabin, the toggle switch used to access information and some functions on the 10.25-inch dashboard screen display has some twitch to it. A low beltline aids all-around visibility and bolstered bucket seats have suede inserts to hold bodies in place in sharp turns. The fit and finish in the Lexus IS 300 is excellent, front seat space is ample and interior trim tasteful and upscale. The trunk is smallish above a spare tire. Rear seats fold 60/40 – not flat. Visors are non-extendable; a must for shading on sunny-day long drives. Looking for your next vehicle? The AAA Auto Buying Service can help. Avoid the hassle of a dealership and get the car you want for the best available price — delivered right to your home! Call 800-590-0145 to find out more.